My collection of Austrian chess sets contains a lot of sets which are not in very good condition. But I thought that all sets would be illustrative and interesting. These Antique sets from Austria are old, but the exact age is unknown. It is possible that they have been made in 18th century. Who can tell me? Unfortunately this Austrian "Selenus" set is not in a very good shape. It could have some replaced pieces as well. Nevertheless it is an interesting set with distinctive Kings, Queens and Bishops. The latter once had feathers, a feature you also see in "Biedermeier Coffeehouse" sets. "Biedermeier Coffeehouse" sets are called so because they were made in and around the Biedermeier period, an era in Central Europe between 1815 and 1848. Very little, if anything at all, is known of Austrian "Biedermeier Coffeehouse" chess set makers in the 19th century. But recently I did some research on Adolf Dreher, which name is on a sticker inside a box with a "Biedermeier Coffeehouse" set I do own for several years already. See the last set listed, with Bishops wearing a top hat. I found the name and the address on several old papers and "Curlisten". 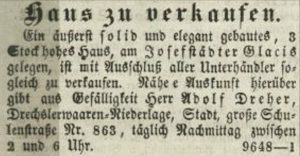 For example, he acted as a broker in this advert on page 6 of the "Fremden-Blatt" of Do, 1. 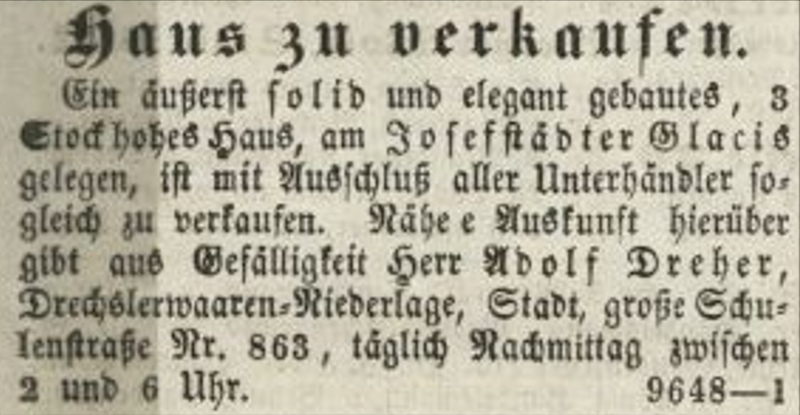 Januar 1852. He owned a "Drechselwaaren-Niederlage" (turner shop) at that time. The address "große Schulenstraße Nr. 863" does not exist any more. In 1862 the continuous numbering of houses was abandoned and changed in a numbering per street. Some streets were renamed as well. I found his name also on several "Curlisten" like this one of 1853, where he is mentioned as "Drechsler" (turner). By the way: "Dreher" means the same. Later I found references in 1855 as "Privat" (private). In the "Curlisten" you find many "Kaufman" (retailer), but also higher ranked military or even nobility. He was apparently well-heeled. Finally I found in “Fremden-Blatt” of April 1, 1868 his name in a list of people passed away in the period of March 26 to 28, stating he died of a lung-oedema at age of 47, being a “Mithausbesitzer” (rental owner) with address Praterstraße 25. Austria, Vienna, by Adolf Dreher, "Biedermeier coffeehouse"
The first "Coffeehouse" set is from Vienna. It is very rare to have urns on the bishops. I would consider this the "missing link" between Biedermeier proper and Old Vienna style. Absolutely the best and most interesting set of this group, in spite of its damage. Set 2 and set 3 are both sets which are normal Vienna sets, but both could have been made in Borstendorf as well. 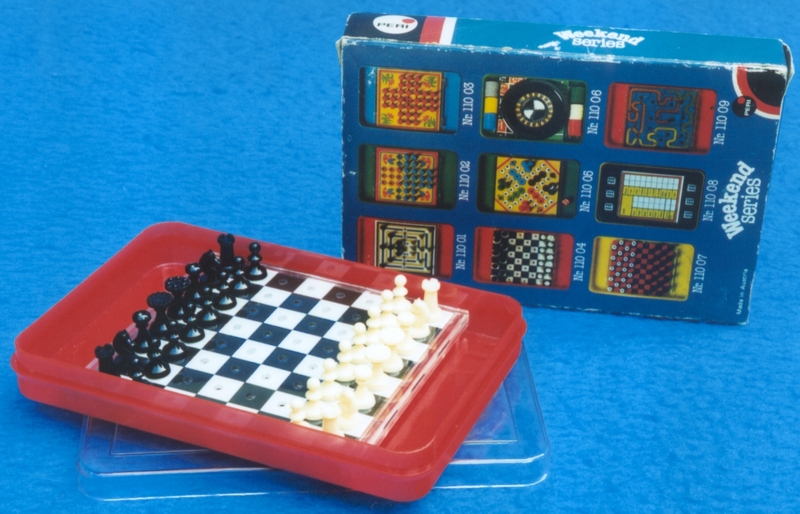 Set 4 to 9 are early plastic sets. Some are made of Galalith. Pieces of that material have been turned and cut like the wooden and bone pieces of that time. If you take a close look at the pictures you can see the marks of the turning on these pieces. It was not possible to use moulds with Galalith. One or two of the sets may be Catalin or another plastic. Catalin requires pieces individually polished. The small size suggests they were made for the toy market, to be added to cardboard compendiums for example. However the first 2 sets in the list are part of a nice wooden casket compendium with pieces that have holes in the bottom, in order to fit over pins on box and doors or the tray that can be used to lift them out the box. One could think that motivation for using plastic is always making it cheaper to produce and improving the commercial margin. That is true for later polymer plastic, which easily could be made in moulds without later additional work. But I believe that wasn't the reason for using Galalith or Catalin. The amount of work with these material is as much as with wood or bone, and I do not believe that the material was cheaper. Another indication is that these sets, in spite of the amount you see in this list, are extremely rare and seldom offered on the market. This is particular true for the small travel set you see here. Striated bishops balls are typical on Viennese sets. Also the size is typical for sets used in the coffee-houses in Vienna. I believe these sets were in use in the coffee-houses till the mid 60ies of the 20th century. The last set is a post war Nekvasil set with the unspeakably primitive knights, made for coffeehouse use or as part of a compendium, considering that pieces have a hole in the bottom. Austria, Vienna, by Nekvasil, "coffeehouse"
The archetype of the "Austrian Upright" is the Schlechter-Lasker chess set. The set listed here is a derivative. It is not known where these sets were made. Although they crop up in Austria, they do not seem to originate there. They are not made in Czechia, and unlikely in Hungary. That would leave Russia as origin. This "Régence" set has been made in an unusual way. For instance, the Bishop has 8 parts, with stem parts having both inner and outer threads and balls in two parts. There is a picture of the Bishop dismantled, however you see only 7 parts because I could not unscrew the 2 parts of the base. Origin is unsure. I bought the set in Vienna, but other say the set has been made by Uhlig.